We've given this Canadian classic added depth with the addition of smoked garlic. The sauce is rich and flavourful; an ideal partner for pork and whole boiled potatoes or use in your own Chili recipe. 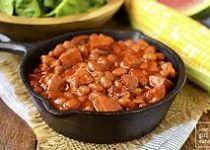 Hands-down, the BEST baked beans! 1) Rinse and soak bag of dried beans (only) overnight in water. Drain, rinse, cover with fresh water bringing to a gentle boil. Reduce heat, cover and simmer until tender, about 40 minutes (do not let beans split). Drain and spread out on a paper towel to air dry before using, reserving 2 cups of the bean cooking liquid. 2) In saucepan, cook bacon until much of the grease is released, drain on paper towels and set aside. Leave 1 tbsp bacon grease in pan for flavour. Add oil and heat over medium heat; cook onion and apple, stirring in mustard, cayenne pepper, salt and contents of Smokey Garlic Seasoning Pouch until softened, about 8 minutes. Stir in tomato sauce (or puree), maple syrup, cider vinegar, molasses and sugar and simmer until slightly reduced - up to 10 minutes. 3) In food processor puree 1/2 cup of the pre-soaked beans with 2 cups reserved bean liquid until smooth. 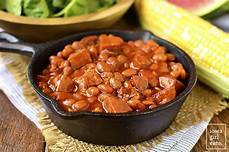 4) Transfer pureed beans an pre-cooked beans to Slow Cooker or 16 cup casserole. Stir in sauce, top with bacon slices. Slow cooker method: 5-6 hours on LOW or Bake method: cover casserole and bake in 300°F over for 2 hours. (For oven bake uncover until thickened and beans are cooked, about one hour before done.) Add some water if too thick.